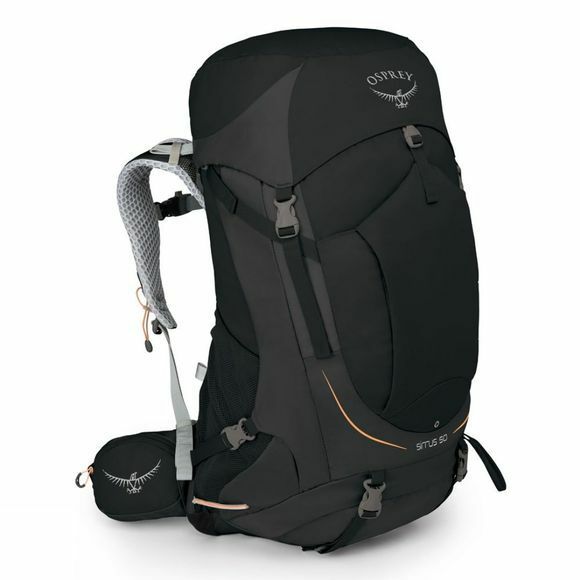 Inspired by Osprey’s AntiGravity technology the gener fitting Women's Sirruss 50 provides a fully adjustable AirSpeed, trampoline suspended mesh back system, which combines the single piece construction of the backpanel and hipbelt with highly breathable suspended mesh. The torso length can also be adjusted, all of which allows for increased comfort in warm weather, even with a heavy load. 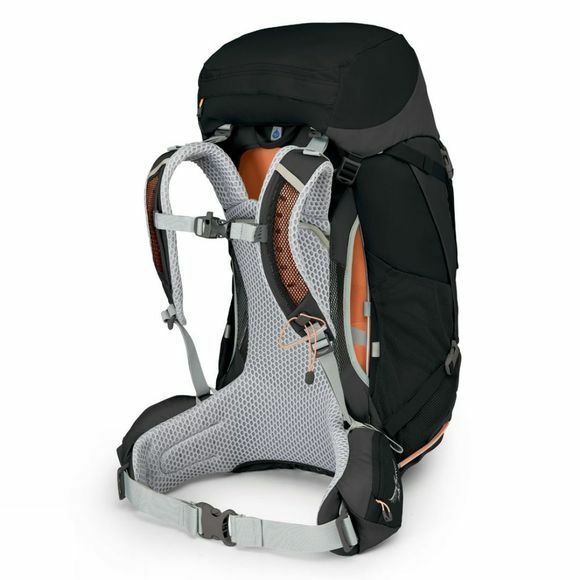 There are multiple entries to the large main compartment with a top lid pull cord, vertical side zip, and a zipped base facilitating easy access to your belongings. A frontal stretch pocket is perfect for packing a waterproof, especially if wet, as it's separated from your other gear. Further storage is provided via stretch mesh side pockets, a dual zipped front panel pocket, and two zipped hip belt pockets that are ideal for snacks or valuables. A zipped mesh under lid pocket is an excellent storage space for valuables or paperwork that you won't need until you reach your destination. Within sits an internal key attachment clip which keeps your key safe and handily placed, so there's no need to rummage around in the pocket. There is also an outer pocket containing an integrated and detachable raincover which can be stretched over the pack. External hydration access is available, with a handy clip so the (up to 3L) reservior does not slip down your back. All of this storage can be thoughtfully compressed using side cinching. A sleeping bag base compartment with internal divider sits at the base, and is ideal for any multi-day expedition. Further hiking specifications include the Stow-on-the-Go trekking pole attachment, which allows you to tuck your pole away so your hands are free to map read, while an ice axe loop sits towards the base of the pack. The Stratos is ideal for weekend adventures with friends as well as day trips with the family.